djkardkreations: Sending a Little Holiday SPARKLE! Sending a Little Holiday SPARKLE! There is something extra special about the fresh clean smell of a brand-new Monday this time of year, don't you think? We have the additional scents of evergreen and pine cones, cinnamon in candles or in cooking, peppermint stuck in the cat's fur. It looks positively edible, doesn't it? Or am I just hankering for a Christmas sugar cookie? I resisted this PTI shaker kit for several months and finally had a cave-in. I'm glad I did. Some trends I steer clear of, but I have to say shaker cards really amuse and please me. And I love the idea of the recipient reciping an interactive card! The paper for the card base and sparkle are from SU. The patterned paper, the sequints, the sediment, and the star and word dies are all from Papertrey Ink. You can see that I layered several of the sparkle die cuts for depth and interest. But what's most interesting about the card is the lack of any obvious Wink of Stella on the word sparkle, which, I mean, just cries out for sparkle, does it not? I winked it, but it doesn't show. I blamed it on the photography, as one does, and the cloudy day, but the truth is, my WOS has been rather anemic for a while now. I've been refusing to think perhaps my Stella was running dry because I can still hear sparkle in there when I shake it. But this time I couldn't stand the lack of sparkle on sparkle, so I opened a new WOS (after I took my other photos) and this happened. WOWZA, I'd forgotten how awesome fresh Stella is! I'm rather miserly with my WOS because I resent how retailers outrageously upped the price of it 30-40% immediately it became all the rage in Blogland. (When was the last time you got a 30-40% raise in your salary in one fell swoop?!) I hope someone is working on a competing product which will bring the price back down to a more reasonable amount for everyone. I made this card at the Lake House standing at the kitchen island with my friend, BABE Kim. She was a huge help to me in between fits of laughter. And now, cornveniently, it fits these challenges. Yipyup! 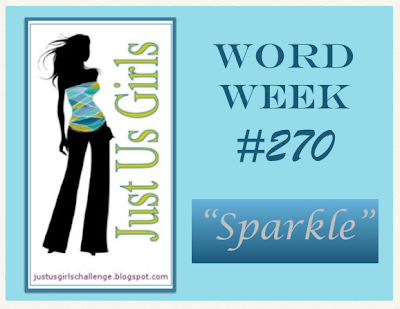 Just Us Girls, "Word Week" and the word is "Sparkle!" Pixie's Snippets Playground, where the brief is always simply to use up those scraps, people. Which we all do, so why not come to the Playground with your card? Simon Says Stamp Wednesday Challenge, where the theme is "Christmas/Holidays." 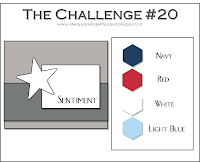 The Challenge, which has both sketch and color components (see below). I used the sketch. The links will take you to the challenges where you can find information on the rules, sponsors, and prizes. I hope you can join in! And that's me signing off. I have a job today in the Playhouse helping Hammy, who is a card-making machine! As always, thank you for coming by to visit the Playhouse and special thanks to you if you take the time to leave a comment and/or join as a follower! Please let me know you came by, so I can be sure and return the flavor! Click the Home tab under my blog banner which resets the post. Click Page Down to reach the end of the post. Click Comments and the pop-up box opens. Click Jump to Comment Form; no more car pool tunnel! Mwah! leave me your email address so I can respond. Thank you! NOTE: I've just been told that suddenly reCAPTCHA has been added to my blog comments. I did NOT add it, so I'm in the process of finding out how to delete it. I'm sorry this happened. Some people are changing from the popup form, but I'm leaving it because there is less chance of spam with the popup and you won't have to scroll all the way down to leave your comment. More importantly, I've found out that if you just ignore the robot reCAPTCHA request and click on "publish" like normal, your comment will publish. (So what was the point of putting it on all our blogs???) Hopefully, they will remove it soon! What a fun festive card Darnell and the thick sparkle word is stupendous!I've heard that if you add a drop or two of water to WOS, and give it a shake, you can get more use out of it for a while. Darnell, did you know you can add water to your pen and it will rejuvinate and have lots of sparkle again. Please tell me you didnt throw it in the bin........ Love your card. I have done a card with lots of sparkle, come have a look. Was going to try entering it in a challenge but dont know how to link to challenges from flickr so will have to wait.Be good!!!! Very pretty and schparkly indeed. The sparkle on your stacked sparkle is WOWZers! I love your sparkle card with the word "sparkle." And, by the way, that yummy looking star does look like a cookie and it's making me hungry. Thanks so much for joining us this week at Just Us Girls! Positively delightful, Darnell. And my WOS pen is lackluster as well. I read in the comments you can add some water? Not sure how to do that, but if you find out, let us know. I may have to do a little research. Thanks for sharing! I LOVE your fun shaker card, Darnell! I couldn't resist either. ;) Love the sparkle you achieved with your WOS! Awesome! So great to see you at The Challenge! Yum, your star does look like a sugar cookie and I'm glad you opened your new WOS so the sparkle could really sparkle! Enjoy your Monday card making frenzy. What a difference the sparkle makes. It really make the word stand out and well, sparkle. You have inspired me to try a shaker card. I did it once and all the sequins fell out. They interacted with my desk rather than the card. Must have been crafter error. Now I can't decide if I should do the card now or make sugar cookies. I do love this card and the sequins on the paper too. Dear Darnell your card is so sweet! I'm staring for a while and can't take my eyes away. It is not easy to "explain" the camera what you want to show. :-) But you succeeded on the second photo. It is brilliant! I need to try a shaker card! This one is super adorable! Love the sentiment and the sequins! You are too funny... and cat fur! Love your darling shaker card! That is one set I kinda wish I bought! Love the wink of stella! Darnell your shaker is yummy enough to eat! Fabulous card and I love the effect of the WOS ... I keep saying I'll buy one ... well maybe DH will add it to my wish list! I have a spare WOS ready to go at all times - great job capturing the glittery shine in your photo! What a fun card! I love how the paper has sequins on it to match the contents of the shaker card. Fantastic! I LOVE this card and all it's fun bright colors. Love this card! Fab and fun!!! Never used WOS but I would be thrifty with too at the price it is. Your card is such fun and has given me an idea or two. Great shaker card, Darnell! I have been resisting this purchase as well, but might need to take the leap! it certainly does look good enough to eat! Thanks for joining us this week at Just Us Girls! Great card, I too just opened a brand new WOS, and wow such a difference. Water to my old one and now it give my watercolor pieces sparkle! Ooooo! I love this and would love a shakey shakey card. Maybe I will make some next Christmas. Hoping I have finished now! If you are logged in you can just go past the robot thing and just publish. Worked for me so far! Love your fun and sparkly shaker!! Very festive. What a super shaker card,I love the colourful paper and sequins and the wonderfully sparkly die cut Sparkle. You card is just so fun, pretty and makes one want sugar cookies...what can be better!?!? Wonderfully done. How fun is this card? I so wanted this Shaker kit but have resisted as of yet. I love that star and the fun papers!! I so can relate to the WOS. I just opened a new one last week after resisting for a long time. They are so darn expensive!! Such a charming shaker card, Darnell! I love the patterned papers and the font on the sentiment is gorgeous! I'm so glad you opened a new WOS...it makes all the difference on this card...LOVE it to pieces! I've resisted the kits so far. This one I thought long and hard about. You're making me think I should get it with the cuteness of your card. So love shaker cards. I bit into that bug when PTI offered the set. I waited online for over an hour to get my order through. The site crashed many times over that night. I agree, Wink of Stella has the market and knows it!!! We can't live without Stella!!! Love your card!! Miss Darnell...every time I think about or see a shaker card I just crack up! Most of the times I am home alone and just laugh out loud. I remember how much time it took to make our cards but I would not trade that for anything. What a fabulous and fun time we had and good thing we were not drinking...can you just imagine what your card might look like now??? It is so so beautiful and I so love your use of Wink of Stella, just stunning my sweet friend. Silly me...forgot to thank you for playing along with us at The Challenge! Several of us baked cookies today at church for our food baskets. mmmmmm.....and yes, this looks good enough to eat! What a 'sweet' card, Darnell!! Great card. I have not tried the shaker kit - yet. Wink of Stella made all the difference in the world. Your shaker card is so much fun! And I agree with you - it's even better with the WOS! Gorgeous! This does look like a delicious cookie! It is beautiful!!!! Cracking open your new WOS was SO WORHT it!! This is such a cute card!! The Sparkle on the Sparkle is DIVINE!!! YAY, this card is EXCITING!! Thanks fo joining Thc Challenge, excited that you did... Sweet shaker!!! Gorgeous. So glad you opened a new WOS. Although I would be squeezing every last drop out too :)! Thanks for the tip about ignoring the word verification and heading straight to publish - it works!!! Pixie Di has put some info up on her blog about the blinking WV/Captcha problems Darnell. What a festive and fun card!!!! I agree, I love WOS but the price is high. I'm sure something will come out that similar and cheaper! Ha!! But only you have so many comments to scroll through Darnell :) OK, OK - I'm OFF the computer now!! This is so fun! I love the glitter! So pretty! Sure wish I could make a shaker card like this! Every time I try, I somehow muck it up! Love yours! Cute card! Sugar cookies do sound wonderful! The robot request has appeared randomly all over blog land, no rhyme or reason. So...I'm obviously not the only one that had visions of sugar plums running wild in the space betwixt my ears...this card really does look good enough to snack on! I love the pink-is background, especially with the 'stacked' Sparkle (wonder what that's like?). Stella #2 definitely has kicked diluted Stella #1 to the curb! I'm going to copy my comment just in case it gets eaten, then try posting without following the rules! It worked! I broke the rules and didn't go to Blogger jail! I like the sparkle I really do. I bought a WOS a while back and it's expensive here in the UK too. so much so that I have only used it meagly once. Glad your liking my stories. hugs Mrs A.
p.s. Next time I ring santa up for an elf and he says 'I have a old retired one on the shelf you can have him for nought as he didn't get on with the kids make sure I hear those bl----dy alrm bells. Love your sparkly cookie card! It does look good enough to eat! And thank you for your sweet comments on my blog. You always take the time to send congratulations when they are in order. You are very sweet!! I just love how you turned that Sparkle into a holiday card. It really does look like a decorated sugar cookie, and now you have made me hungry. This card DOES make me hungry for a sugar cookie! What a beautiful, sparkly card! Thanks for joining us at Just Us Girls! Love your cute sparkly good enough to eat shaker! So glad you caved and got the kit cause it's a goooood one isn't it? Sorry I'm a bit late calling by again, not supposed to be peering at laptop really but wanted to just check that the Playground hasn't been overrun by naughty elves!! Really cute card! by the way, I gave you a "shout out" on my blog! Now this is one fun & festive card, Darnell! Love the colors scheme! What a nice card! I love sequins and this card is gorgeous!!! I have been visiting your blog and now you have a new follower! Hugs from Spain! Click picture to go inside! I have been stamping and making cards since 2002. I've been married 47 years to Kevin, known herein as "Mister." Our son Daniel and his wife Rachel have twin sons Henry and Adam. Card-making and blogging are wonderful hobbies which have brought me noodles of friends! Oh, and I have an imaginary hamster named Hammy who keeps me in line. Thank you for visiting, joining, and commenting! It will be my pleasure to return the flavor!! I have posted for your personal inspiration only. Text/pictures © Darnell J. Knauss @ djkardkreations .com. All rights reserved. Nothing may be copied or changed without my permission. Please respect this disclaimer. Thank You! Copyright. Original artwork by Darnell Knauss. Blog designed by Loll Thompson - 2017. Powered by Blogger.